Since I received a lot of requests for thinking particles resources, this is a post to collect all the training and info available for thinking particles on the web, free or by payment, if you know some other sources please write a coment below. Effectivetds Together with Goran Pavles we created a portal dedicated to FX in general. You will found a lot of useful Tools, a lot of them for ThinkingParticles, also Courses, and a Forum with a growing TP community. TP4 for production Joe Scarr TP master together with Goran Pavles presents a DVD with more than 27 hours of information for 50$ Now free! on his vimeo channel. This tutorials are more for an intermediate/advanced user, covering a lot of tips and tricks for production and mathematics basics. This is the most complete and advanced guide to tp you will found online for free. TP Mayhem Joe Scarr collected multiple problems/solutions, blackboxes and knowhow over the years, collected on this site. This is a gold mine! Joe Gunn Joe Gunn has multiple tutorials on his Vimeo channel covering new TP6 operators. Cebas tutorials You will found here a bunch of tutorials, most of them its Joe Scarr explaing each node. But you will found some “how to do” some cool effects. Hristo Velev Hristo Velev is sharing a lot of techniques on his blog and youtube. You will found free videotutorials, tools, and blackboxes. Mihai Panait Mihai Panait has some cool and easy to follow tutorials on his youtube channel. Im your friend Will wallace has a bunch of long and good tutorials from intermediate to advanced with a lot of good tricks. 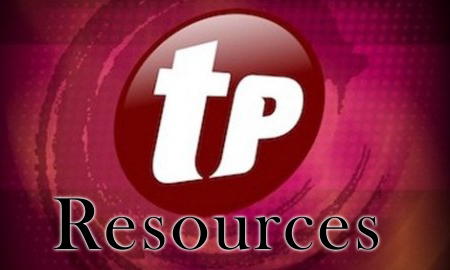 Rui Romano Has a collection of TP video tutorials on his vimeo channel. Philip J.Fry (or rman197) Philip has big knowledge on mathematics and physics, he shares diferent tutorials and TP setups, you can learn russian at the same time,:) (video tutorials are easy to follow). Andrew Melnychuk-Oseen Andrew has multiple TP tutorials and blackboxes on his blog, big knowledge on mathematics and trigonometry. Michał Maciejewski Multiples R&D and some TP tutorials and blackboxes. Hammer Chen Diferent tutorials about TP in chinese. Take Imazu This Japan artist has multiple tutorials on his blog (in japanese). Igou Lots of cool tutorials on his webpage (some in japanese). Kei Yoneoka A japan artist sharing a lot of blackboxes and great tips and tricks (in japanese). Fabian Diferent R&D with TP on Fabian vimeo profile, sharing diferent blackboxes. Alex Lombardi Alex has diferent TPscripts on his webpage to make your life easier. Also created the TP group on vimeo, a collection of all TP works on vimeo comunity. Michael Stark Michael has a lot of R&D on his vimeo with TP. Interesting information on coments. Jacys Lin Diferent and crazy R&D with TP on his vimeo profile. Toufik Mekbel Toufik has amazing R&D works on his vimeo channel. Sharing some TP techniques, also a big understanding on pflow where you can found good ideas to apply on TP. Greyscalegorilla Chris Schmidt guides us on this tutorials for Thinking Particles and cinema 4d. The basics between TP for cinema and 3dsmax are exactly the same so its not so dificult to follow and learn. Vfx Arabia Multiple tutorials and tools for free. Hernan Llano Hernan has a TP tutorial on his webpage covering volumebreak in spanish. Andvfx You know me, Diferent tutorials and TP tools. Subscrive to my YOUTUBE, Check my playlist, I have one with all my free tutorials in English and one for all my free tutorials in Spanish. EffectiveTDs We have some free and paid Tutorials covering multiple TP courses. Eat 3d TP intro2 The best two dvds to start on TP, from TP guru Hristo Velev. Easy and fun to follow from the beginning, in total more than 16 hours of training, 60$ each one. Digital tutors Haji Gadirov shares some techniques for destruction on digital tutors under subscription. HouseFx Will Wallace add together in a single package more than 10 hours of training mastering TP destruction and all the workflow involved in a real production. Also explains preshot planning, fumefx, rendering and Nuke compositing, from 89 to 129$. Facebook Cebas Oficial Cebas technologies facebook webpage. Facebook TP Unoficial Thinkingparticles facebook webpage. CGsociety Forum for Thinking Particles. Thanks for the invaluable resources. I’ve been searching months and this post saved me a lot of time googling. thanks for sharing this! much appreciated! Nice resource thank you, also check out http://www.helloluxx.com for more C4D TP tutorials and downloads. Hi, do you know how i can increase the spin value over time? Basically i wanna go from 0 to 10 spins per sec over time. Thanks. Is in fact the TP4 for production listed on payment tutorials. For sure I will update that Izat, Is an amazing DVD, and now free! thanks for the great collection, Eloi!